Currently, live chat is becoming very popular, and most people prefer to communicate through it because of its easy usage and simplicity. Surprisingly, most businesses still rely on phone calls to meet their clients’ needs and solve problems. If a client is facing an issue, they have to call customer support or a call center to speak with their customer service representative. This process is time-consuming and usually leaves the client frustrated. Many businesses have discovered that the way forward is live chat. With live chat, your clients will be well engaged, and this is an essential ingredient for the success and growth of your business. This form of communication offers enormous benefits over the usual method of traditional customer service. This can even be the difference between a happy/satisfied client and an unhappy/unsatisfied one. So, why is live chat preferred in the industry currently? In the past, Live Chat always seemed to be an optional way of communicating after a phone call or email. But, with the times, things have changed. Buyers are forcing companies to adapt and transform their businesses in order to meet their growing expectations. Today, more than 30% of customers expect to see a live chat system on your website. Thus, if you are not using a live chat software system, you are losing a lot of business. Let’s take a look at some of the benefits that online chat can offer in terms of delivering great service and increasing your online sales. Currently, most people prefer to live chat than make a phone call. They simply don’t like talking on the phone. With the evolution of technology, phone calls are becoming somewhat outdated. Most young people rarely use the phone anymore; they prefer live chat and message text to converse. Web chat allows customers to communicate with you in a comfortable manner. This can easily lead to sales. A recent American Express report showed that 9% of Americans would spend more on brands that offer excellent customer service. Most people like to do business with companies that have quick and easy accessibility. While the internet plays an important role in expanding your reach far beyond your local area, just having a website doesn’t necessarily mean that your visitors will feel comfortable purchasing your product/service. However, if your website has live chat software, even clients who are far away from your physical location can contact you instantly to arrange purchases or to make inquiries. Website chat will help you in expanding your market reach to areas you may never have considered possible. How often do you see a live chat option on a website? How often are they active? Live Chat is still new in the market place. Most organizations haven’t invested in the technology, and others do not offer it 24/7. Tradeshift, using proactive live chat software, increased their sales opportunities by 32%. They started with a simple mission of making it easier for businesses to collaborate around the world and pay each other online. To date, Tradeshift has expanded to 1.5 million companies in 190 countries, processing more than $500 Billion yearly transactions. According to the American Marketing Association, customers who use live chat are 3 times more likely to buy, the conversion rate is increased by 20% and the typical ROI rate by 305%. The above numbers might seem too good to be true, but with a winning chat system, you will find how real and beneficial live chat is! With a website chat, you can quickly connect with your customer. This can lead to a huge upswing in customer satisfaction. Customers like to be attended to as fast as possible. They hate to be told to wait because of call queue backups. The faster you connect to your customers, the greater the chance that they will make a purchase. According to Econsultancy, 79% of people prefer to live chat because they get responses to their questions instantly. 46% agreed that live chat is the most efficient communication method. 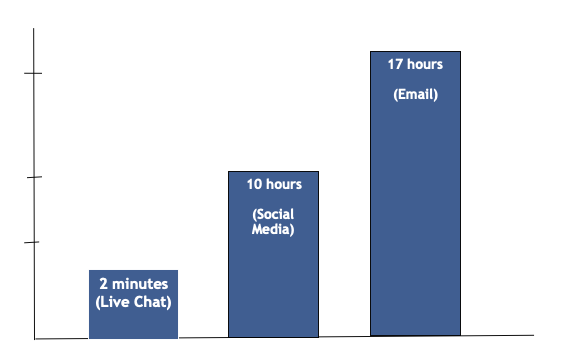 Considering that the average response time for email is 12 hours, 10 hours for social media, and 7 seconds( fastest response) to 9 minutes (Slowest response) for live chat, they appear to be right. Approximately 21% of live chats get ignored. Organizations who use live chat should treat them the same as a phone call and never leave them unanswered. Live chat support during the checkout process increases the number of sales and conversion rate. The whole idea of live chat is to be available online 24/7 so that customers are not lost. Stats show that 83% of visitors require some online support when making an online purchase. This is the reason why customers prefer to purchase from a website that provides live chat support. 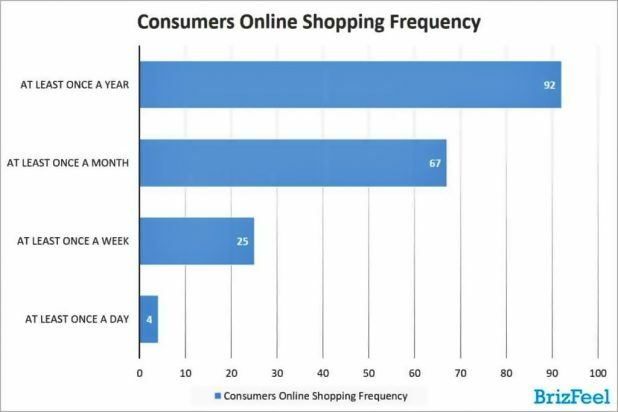 Brizfeel’s 2018 report on Consumer Online Retail Shopping and Spending Behavior which was based on a survey of about 30,000 people, showed “that a quarter of them shopped at least once a week, while 67% made a purchase at least once a month.” But the issue was they did not have someone to answer their queries during their shopping experience. With the web chat, you can give quick answers to questions and inquiries about your products, solve your customers’ problems faster, and assure them that you’re there when they need you. This is an easy, yet very effective, way to improve your customer confidence and loyalty. According to White House Office of Consumer Affairs, a loyal customer is worth up to 10 times as much as their first purchase. Selling has come down to serving customers first. If you offer superior customer support through live chat, you are sure to keep a customer for a lifetime. Reports show that 89% of customers stopped doing business with a brand after a poor customer support experience, while 86% pay 25% more if they get a better customer experience. The ability of live chat to allow your site visitors to reach you instantly cannot be stressed enough. However, its ability for proactive outreach is what makes it very powerful and robust for your business. Modern website chat systems offer your website visitors the option of clicking your chat button to contact you at any time and also allow your agents to do the same. With robust monitoring and tracking features, web chat platforms can alert you whenever a visitor comes to your site. They also provide valuable data that can be used to initiate conversations. Live chat offers a great customer experience and builds a strong relationship with customers. It has become a must-have business tool for every business. ChatMate is live chat software with agents working 24/7 to maximize your sales leads. The team at ChatMate will engage your prospects through instant chat on your website. We are experts at using the power of conversation to deliver more leads from your website traffic. ChatMate has managed 25,000+ conversations for varied businesses. Talk to our experts today to learn how you can reduce support cost instantly by 15%. Ashok Sharma is a writer, blogger, digital marketer and social media enthusiast. Ashok currently hold the position of digital marketing manager at GrayCell Technologies. Follow him on Twitter or LinkedIn. The post How to Boost Your Website Conversion Rate with Live Chat appeared first on SiteProNews.